Mario's got quite a diet. "For what had Prometheus done in the first place? He had given humans a power-up." Something which is found in the game environment that bestows a positive benefit. Different from inventory items in that it's effect is usually instant. Often inexplicably drops from the corpses of fallen enemies, and is found in unlikely places and breakable objects, or the odd treasure chests. 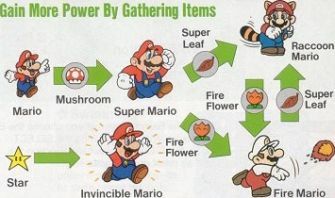 A feature found in many games is the cycling power-up, an item that cycles between two or more different power-ups (either on its own or when you shoot it), forcing the player to decide on which one is most important to them. Depending on how fast it cycles, it also tests the player's timing. These are common in space shooters. Medkit with red cross (ironically, The Red Cross doesn't like this, since the red cross is a symbol regulated by international laws with a very specific meaning; the actual first aid symbol should be a white cross on green). More recent works have started using glowing green crosses instead. Healing Potion, usually a crystal vial with neon red, green or blue liquid inside. A common trait among powerups is that you often don't need to do anything other than touch it to gain its benefit. Fly your fighter into the floating container of radioactive materials (Raptor: Call of the Shadows), send the chopper into a bomb pod (Twin Cobra), and they just get installed or deposited instantly. Usually an Acceptable Break From Reality since no-one really wants to fly out of a dogfight to spend some quality time in a hangar with a wrench installing a missile pod—and dealing with the damage from ramming it into the fuselage to catch it at mach 50. When a common powerup is used to increase the player's weapon level or something, collecting more of it after reaching maximum level often results in Scoring Points instead. Sometimes comes with its own Power Up Motif— usually when it's a Timed Power-Up— as well as the Standard Powerup Pose. Compare Status Buff, Power-Up Magnet. If the powerup isn't very useful, see Power Up Let Down. If a level doesn't contain a powerup, it is a Drought Level of Doom. Contrast Poison Mushroom, a power-down.